If a player cleans their ball during play of a hole except as provided in this Rule, they incur a penalty of one stroke and the ball, if lifted, must be replaced. This week I received this question about cleaning a ball that had been lifted because it was deemed to have been interfering with another player’s ball, as permitted by Rule 22-2. Q. A player is asked to lift his ball, which is lying through the green or in a hazard, because the ball interferes with the play of another player. The player authorizes the caddie to lift the ball and, having marked its position and lifted the ball, the caddie throws the ball to the player who catches it. Except when the ball lies on the putting green, it is not permissible to clean a ball lifted because of interference. Does the act of throwing and catching the ball constitute cleaning it? A. Whether the ball is cleaned is a question of fact. The action described could result in a ball being cleaned. Any doubt should be resolved against the player. Obviously, the course conditions have to be taken into account in determining whether the ball was cleaned. If the ball had mud on it then it is likely the action described may have loosened some mud. 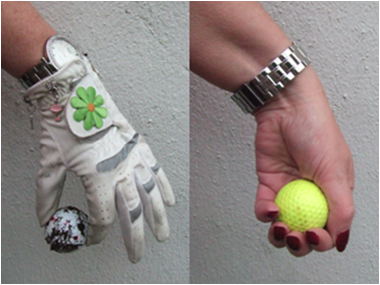 However, if the course conditions were dry then cradling the ball in a hand (as in the right-hand photo above) is highly unlikely to have cleaned it. The reason that many players pick up their ball using their forefinger and thumb is to show that they are aware that the ball must not be cleaned. There is nothing in the Rules that requires the ball to be handled in this manner. The second ruling raised by this question concerns the writer’s belief that a breach of the Rules may be overlooked in match play, which is not quite correct. Certainly a player may observe a breach of the Rules by their opponent and not say anything, which differs from a player’s responsibility to all the other competitors in stroke play. But once a player suggests that there has been a breach and the opponent disagrees a claim must be made under Rule 2-5, so that the Committee may make an informed ruling based on the evidence. Players may not ignore a breach of a Rule once it has been brought up, or they would be breaching Rule 1-3, Agreement to Waive Rules, incurring the penalty of disqualification. Edit: My thanks to Richard for pointing out that Decision 20-1/0.7 rules that there is another instance where a player may not clean their ball when lifting it. This is when they a player lifts their ball to determine whether they are entitled to relief under a Rule, e.g., to determine whether their ball is in a hole made by a burrowing animal, or is embedded. 1. You can receive these weekly blogs in your email by subscribing your name and email address in the box at the top right hand corner of my home page. If you are not subscribed to either of these lists I strongly recommend that you do so now, as it is a great way to get to understand the Rules better. There is absolutely no charge and it is easy to unsubscribe at any time. I do not share your contact details with anyone else. Click here to join ‘Rhodes Rules School’. If this matter once raised was not resolved and no "claim" was made before either team started the next hole can the "claim" be made later? Second, if no "claim" is made, are both teams subject to disqualification if this matter becomes common knowledge later. What is one's role in stroke play if a rules breach is observed and/or commented on to one's fellow competitors. The players could agree to halve the hole, as they could not agree on the ruling. This would enable them to continue the match without either of them making a claim. A claim may not be made after they have teed off at the next hole, or have left the putting green of the 18th hole. In stroke play, if a breach of a Rule is observed the player witnessing it has a responsibility to all the other competitors in the same competition to make the player aware of it. If the player refuses to acknowledge the breach the marker should not sign the score card and bring it to the attention of the Committee. If the player and the marker both sign the score card knowing that the score does not include a penalty that may have been incurred they are liable to disqualification for agreeing to waive a Rule. The Rules of Golf only provide relief from sprinkler heads, which are immovable obstructions, if they interfere with the player's lie, stance or area of intended swing (Rule 24-2). However, many Committees introduce a Local Rule permitting relief from sprinkler heads on the line of play close to a putting green. Typically, this will be if the sprinkler head is within two club-lengths of the green and the ball lies within two club-lengths of the sprinkler head. However, you always have to check the Local Rules to see if there is such relief and if so, the exact relief that is afforded. Stroke play competition, blue stake lift the ball but a big slug of mud, can the ball be cleaned? If the ball moved while you were moving the blue stake, assuming it was a movable obstruction, you could replace it as explicitly stated in Rule 24-1. However, the player should try and remove the obstruction without moving their ball. If the blue stake was immovable (unusual) the ball may be cleaned before it is dropped in taking relief under Rule 24-2.